The place TO BE on the North Shore. A morning stop at Java Kai for a Belgian waffle, sumptuous muffin or latte before embarking on surfing or hiking ranks high on life's TO DO lists. Reminder: just two more days until our contest ends. Entries have been pouring in, make yours a winner! 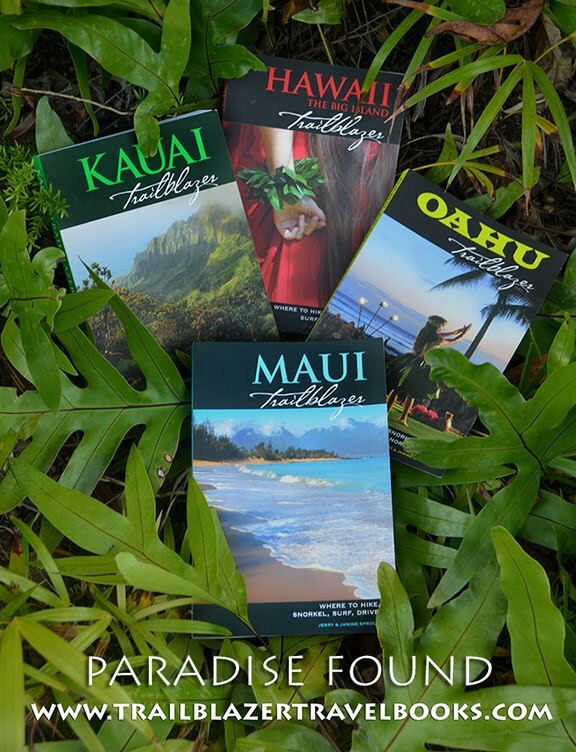 To celebrate the launch of the new 2009 Oahu Trailblazer, we're giving away five free copies to selected blog readers. 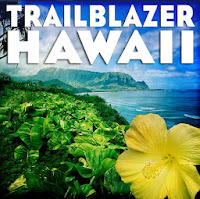 To win one all you have to do is write to us at trailblazerhawaii@gmail.com and tell us what you enjoy most about this blog and why you'd like a copy of this Trailblazer guidebook. Appreciation for Hawaii counts as does a sense of fun. Winning entries will be posted here at the end of the month. Good luck and thank you for participating! 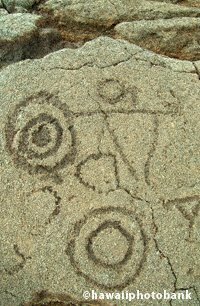 To learn more about this guidebook, go to the Amazon.com list in the right hand column and click on the Oahu image. 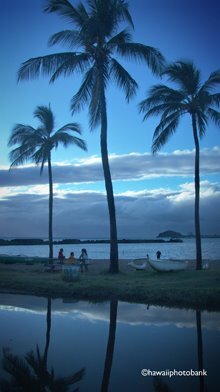 Laidback Kapa'a (Kah-pah-ah) on Kauai's Royal Coconut Coast doesn't get near the press in slick travel magazines—it ain't swank—but the most powerful among the ancient Polynesian voyagers chose this coast to settle, when they had their pick of anyplace on all eight islands. 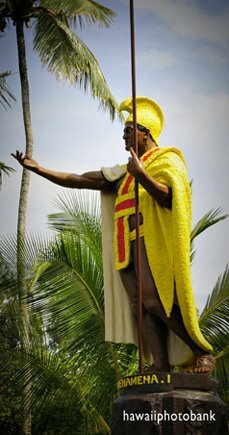 The primary calling card for the Hawaiian rulers was the Wailua River, a fountainhead of fresh water and agriculture terraces smack dab in the middle of the Pacific. The many-acre fields of palms that shade Kapa'a's miles-long coastal paved path were planted by one of the last of the Hawaiian monarchs. You can walk or bike from a number of mid-range resorts near the river along beach-front, through a weatherworn beach cottage neighborhood, to the shops and restaurants of town. This a flip-flop place, so don't break out the strappy wedge sandals. Hiking is good inland (Sleeping Giant Mountain and Mount Waialeale) and the Coconut Coast is a midway point between two of Kauai"s bell-ringing attractions: Waimea Canyon and the Hanalei coast. From the rainiest mountain in the world (Mount Waialeale, average about 40 FEET yearly) radiate steep shoulders covered in inscrutable tangles of greenery—and laced in the creases by streams and waterfalls. Green on green, thick carpets under a woven canopy of leaves and vines, an uncountable melange of plantlife fights for space and daylight. Kauai is called aptly the Garden Isle, a Garden of Eden, where, ironically, flora must struggle for survival despite inhabiting such fertile soil and optimum conditions. 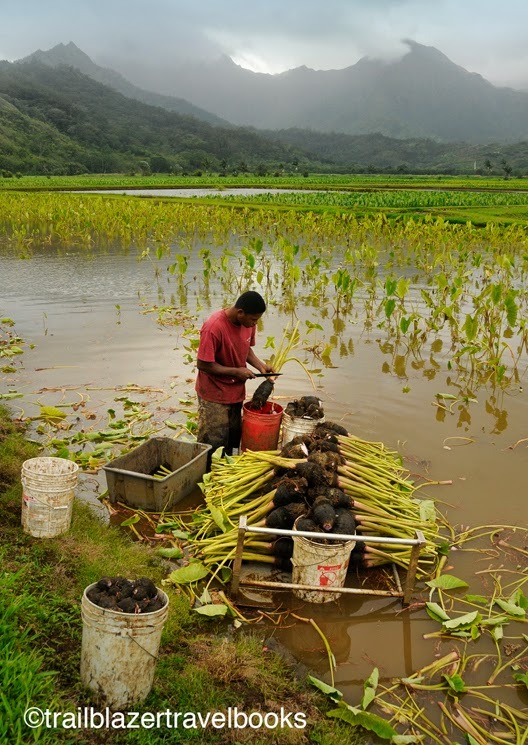 One of the best places to see the green show is the Keahua Arboretum, which is several miles above the coastal town of Kapa'a on the east side of the island. 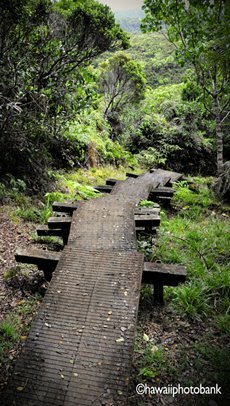 You have a choice of several trails, including a short turkey trot around the grounds, a 10-mile round-trip hike or bike to the "Blue Hole" at the base of Waialeale, and the 14-mile Powerline Trail that crosses the island and pops out at Princeville on the north shore. 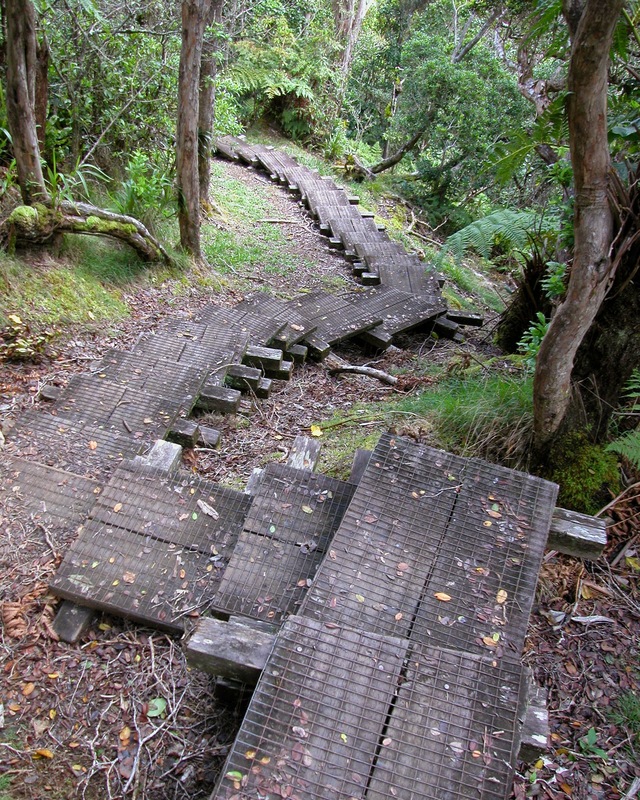 But maybe the best choice is the Kuilau Ridge Trail. This family-pleaser delivers the drama of a jagged-ridge hike with relatively minimumal of effort (4.5 miles, round trip, with 500 feet of elevation gain), taking forests, ferny gardens, and and a picnic glade with blue-water views. See page 84 of Kauai Trailblazer. Hurricane Iniki removed the ship that in 1970 ran up on the reef of this south Kauai beach, but in any case you will hardly feel marooned: This surfer's run of sand fronts the Grand Hyatt Kauai, perhaps Hawaii's (the world's?) best tropical resort. The low-slung (by law, no building on Kauai can be "taller than a coconut palm") resort with Asian-inspired architecture features several airy levels that give way to a sprawling fantasy pool and saltwater lagoon, before reaching the wild sands. 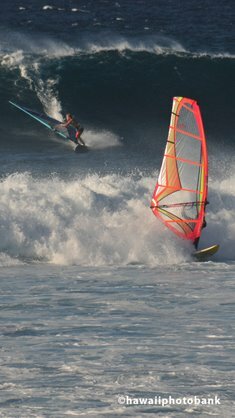 Active vacationers love the Mahaulepu Heritage Trail, which skirts the wild sea bluffs to the south. Nesting seabirds and whales offshore (in the winter and spring) attract nature lovers, while history freaks can inspect the large Ho'ouluia Heiau (temple). The two-plus-mile path reaches Gillan's Beach and then Mahaulepu Beach, both good for snorkeling. You may see a an endangered Hawaiian Monk Seal. A trail continues another mile or so to remote Haula Beach. Kauai's Awa'awapuhi Trail is to tropical ridge hikes what the Golden Gate is to bridges and the Eiffel is to towers—powerfully beautiful and unique. From the road above Waimea Canyon, the trail descends about 1,700 feet over 3.5 miles through a native forest rich with birds before popping out out to a view of the green escarpments of the Napali Coast and the Pacific, still a couple thousand feet below. Across the steep valley (look for wild goats) is another fabulous ridge which is the end point of Awa'awapuhi's sister hike, the Nualolo Cliff Trail. A trail connects the two ridges, making for a adventure seeker's dream loop hike. Be aware: The trails are not dangerous to the careful hiker, but drop-offs are to be avoided, and after rains, which is often, the packed earth is slicker than snot on a door knob, making slip-and-sits a likely occurrence. Bring a hiking pole. See page 167 of Kauai Trailblazer.